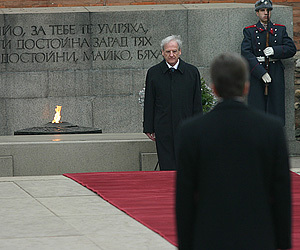 Hungarian President Laszlo Solyom arrived Tuesday in Bulgaria on a two-day visit. President Laszlo Solyom was officially welcomed with a red-carpet ceremony on St Alexander Nevski Square in Sofia by his counterpart Georgi Parvanov, at whose invitation the visit comes. President Solyom is scheduled to have one-to-one talks with his host and the official delegations will have plenary sessions, after which the two heads of state will give a news conference. Meetings with Parliamentary speaker Georgi Pirinski and Prime Minister Sergey Stanishev are also on the agenda of the visiting president. The Hungarian President Laszlo Solyom will arrive to the city of Shumen on February 6 to lay a wreath at the monument of the Hungarian revolutionary Lajos Kossuth. He will be welcomed by the mayor of the Shumen Municipality Krasimir Kostov, and later will visit the Madara historical preserve.